China has a long history of afforestation and today, this glorious tradition continues across the country. In the last few decades, discussions on green development together with the nation’s robust economic growth have become ever more pertinent. Companies are only now realising the importance of developing sustainable practice that focus on meeting current business goals without compromising the ability of future generations to meet their needs. As such, being environmentally conscious as well as balancing the varying needs of development and preservation is now a significant part of day-to-day life. The company also are industry leaders when it comes to environmental innovation. In June 2010, Messe Frankfurt became the first German trade fair organiser to join the United Nations Global Compact. Since 2014, the company also formed an energy management team dedicated to implementing environmentally friendly workplace solutions. As a result, the group has recently announced that it will change all of its electrical consumption to renewable energy as of the event year 2020. This includes the power supply to stands, halls and exhibition grounds at the company’s headquarter in Germany. It is expected to eliminate some 19,000 tonnes of carbon dioxide each year. For these reasons, Messe Frankfurt are therefore pioneers for the sustainable practice in the trade fair industry. Many of Messe Frankfurt’s trade fairs around the world have also started to integrate environmentally friendly practices. For example, the Chengdu International Trade Fair for Automotive Parts and Aftermarket Services (CAPAS Chengdu) announced its green efforts at the Arbour Day. Ms Fiona Chiew, Deputy General Manager of Messe Frankfurt (HK) Ltd said: “CAPAS is Messe Frankfurt’s first trade fair servicing Southwest China’s automotive industry. In every edition of the show, we see more and more green products and solutions driving innovation throughout the industry. With more emphasis placed on environmental awareness, the show introduced a dedicated zone for new energy vehicles and infrastructure back in 2016. 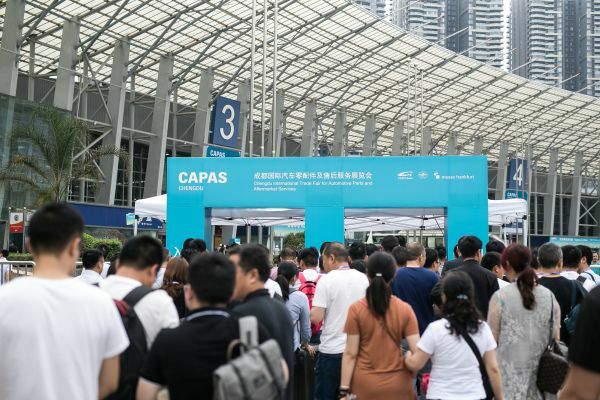 The sixth edition of CAPAS will take place from 23 to 25 May 2019 in Chengdu Century City New International Exhibition & Convention Center, China. As a result of the region’s rising position for the manufacture, distribution and sale of cars, the fair expects to welcome over 600 exhibitors across the 45,000 sqm of exhibition space. Visitors will see upgrades to its seven dedicated zones, including the new tyre sector. Attendees will also be able to explore many green elements reflected in car painting, tyres, replacement parts and commercial vehicles throughout the fair. CAPAS is jointly organised by CCPIT-Auto, Messe Frankfurt (Shanghai) Co Ltd and CCPIT-Sichuan.